Itsy Forth is a tiny subset of the Forth programming language. So far we've looked at the Forth outer interpreter, inner interpreter and dictionary. This time we'll define the words required to complete the interpreter. ( before -- after ) shows the contents of the stack before and after the word executes. Here's how @, c@ and ! are implemented. Remember we're keeping the top element of the data stack in the bx register. if, else, then, begin and again all compile to branch or 0branch. The destination address for the jump is compiled in the cell straight after the branch or 0branch instruction. execute stores the return address on the return stack and exit removes it. accept reads a string of characters from the terminal. The string is stored at addr and can be up to len characters long. accept returns the actual length of the string. word reads the next word from the terminal input buffer, delimited by char. The address of a counted string is returned. The string length will be 0 if the input buffer is empty. abort initialises the stacks and a few variables before running the outer interpreter. When Itsy first runs it jumps to abort to set up the system. Great to see a Forth resource like this one that I saw on Reddit. Well done John. 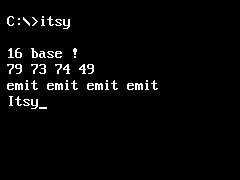 I bet it was a great feeling when the interpreter output "Itsy". Keep up the good work. Could you please provide an example in Visual Basic .NET. It is not a very good practice to use assembly language in high level software. Tsk, tsk. This is *retro* programming. Nothing later than IBM BASICA, surely? Thanks for these posts - fascinating! How did you get this up and running when (unless I've missed it) you don't yet have definitions of the control strucutres (IF, AGAIN) used by the outer interpreter? Did you hand-compile the 0BRANCH calls in the outer interpreter? I compiled the outer interpreter by hand. Also : and ; will be hand compiled. After that I'm hoping everything will be defined from the Itsy prompt. Can't count be implemented with extant primitives? It's been a very long time since I've done any programming. This does look like a good language to learn. fantastic post .I really impressed to see your way of explaining codes .can you tell me what to do to learn the assembly language. counter value. Three words rather than four. This isn't a problem for interpret, which almost immediately calls abort and clears the stack out anyway, but for somebody else who might try to use >number independently, this could be the source of some serious hair-ripping frustration. It looks to me like it would be easy to fix this simply by changing the "jc to_numh" line to read "jc to_numz". Okay, it's time for an OOPS! moment. Seems I made my previous comment a bit too hastily. I noticed after the fact that there was another push to the stack BEFORE the jump in question, and it does indeed put the low word of the double number back on the stack as it should if >number aborts. The modification I suggest to the code is not necessary; in fact, making that patch would be a bug in and of itself. The code returns the correct number of items on the stack as it is, regardless of whether it encounters an illegal character or not. I cobbled together some simple numeric output routines and confirmed this. However, just to save you from repeating another mistaken assumption I made, let me warn you that the number at the top of the stack after >number is executed (the length counter) is not a reliable indicator of whether >number has successfully converted a numeric input string. Under some circumstances (such as if the very last character in the string is non-numeric), it can have a value of zero even if >number detects an error and aborts. Looking at the code now, I don't think John intended that number to be used for error-checking as I'd originally thought. It's just a counter, not a fault flag. It would be nice to have one available, though. I may see if I can modify the code so that it can be used as such. My apologies for any confusion my earlier post may have caused. Thanks for the bug report, I'm not sure how it slipped through. It can be fixed simply by moving dec bx further down. I've fixed the code above. Mike, as specified, >NUMBER also supports the legacy Forth practice of placing ANY character as a separator to tell the interpreter/compiler to parse a double. Its also used to handle leading + and - flags. So, start with an arbitrary string. Store 0 in the FIXED? 2VARIABLE. Start converting. It stops at the first value. You do an over C@, store it in a variable, and keep going. It stops again. You store the character and the index in the FIXED? 2VARIABLE and keep going. It completes. You look at the leading character, decide what to do (most often its a - and you call DNEGATE. If the routine that called the number parsing routine is treating values with different decimal point locations differently, the required information has been stored. So while this interpreter does not have Forth standard number conversion, a use of the information contained in the >NUMBER routine when stops on a non-numeric would support extending it to include it. would itsy forth then run as a standalone system (ie no operating system)? Note that if you have NAND R> and >R you can get the ANS Forth CORE logic words and most of the rest of the CORE stack manipulation words. May as well add some more thoughts on extending this through to a Standard ANS Forth (at least as far as ANS Forth CORE). Whether hardware division is floored or symmetric ~ that is, whether UM/MOD is FM/MOD or SM/REM ~ the other can be derived from the result, and using the hardware integer divide then correcting is both more compact and quicker than writing a division routine in Forth. EVALUATE looks like it would be tricky, but it can be done with your interpret by adding a SOURCE-ID variable and testing it in your INTERPRET. Pushing the current TIB #TIB >IN and SOURCE-ID onto the return stack, store the evaluated string address and count, set SOURCE-ID to -1 >IN to 0 and call INTERPRET, then restore them. And the cold start so that 0 is stored in source-id. Now the outer interpreter will loop endlessly for source-id of 0 but will return when called for a single input line by EVALUATE. UMAX and UMIN similarly, but they require U<. .... though the hardware primitive of subtracting them and setting the flag based on whether there was an overflow carry can easily be shorter, and if so, implement it as a primitive.